TAFs (TATA box binding protein associated factors) are part of the transcription initiation factor TFIID multimeric protein complex. 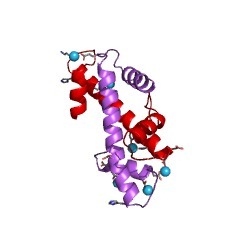 TFIID is composed of the TATA box binding protein (TBP) and a number of TAFs. The TAFs provide binding sites for many different transcriptional activators and co-activators that modulate transcription initiation by Pol II. TAF proteins adopt a histone-like fold. 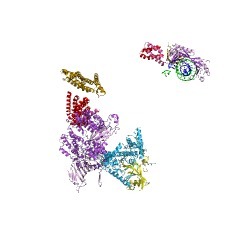 The TATA box binding protein associated factor (TAF) is part of the transcription initiation factor TFIID multimeric protein complex. TFIID plays a central role in mediating promoter responses to various activators and repressors. It binds tightly to TAFII-250 and directly interacts with TAFII-40. TFIID is composed of TATA binding protein (TBP)and a number of TBP-associated factors (TAFS). TAF proteins adopt a histone-like fold. There are 1736 TAF domains in 1726 proteins in SMART's nrdb database. Taxonomic distribution of proteins containing TAF domain. This tree includes only several representative species. The complete taxonomic breakdown of all proteins with TAF domain is also avaliable. Click on the protein counts, or double click on taxonomic names to display all proteins containing TAF domain in the selected taxonomic class. Structural similarity between TAFs and the heterotetrameric core of the histone octamer. A complex of two TFIID TATA box-binding protein-associated factors (TA FIIs) is described at 2.0A resolution. The amino-terminal portions of dTAFII42 and dTAFII62 from Drosophila adopt the canonical histone fold, consisting of two short alpha-helices flanking a long central alpha-helix. Like histones H3 and H4, dTAFII42 and dTAFII62 form an intimate heterodimer by extensive hydrophobic contacts between the paired molecules. In solution and in the crystalline state, the dTAFII42/dTAFII62 complex exists as a heterotetramer, resembling the (H3/H4)2 heterotetrameric core of the histone octamer, suggesting that TFIID contains a histone octamer-like substructure. This information is based on mapping of SMART genomic protein database to KEGG orthologous groups. Percentage points are related to the number of proteins with TAF domain which could be assigned to a KEGG orthologous group, and not all proteins containing TAF domain. Please note that proteins can be included in multiple pathways, ie. the numbers above will not always add up to 100%.